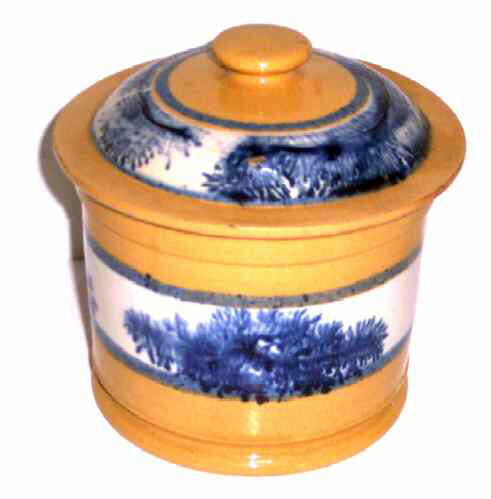 Covered Jars such as this one were used for a multitude of purposes from storing foodstuffs, butter, or even tobacco. As with most any ceramic, covered pieces are very desirable and not commonly found with the lid still intact as they had a high mortality rate. This lid was very fortunate in that the finial is quite high and is easy to grasp unlike some others. The darkeness and abundance of the Cobalt Seaweed decoration makes this a very desirable addition to a collection. The glaze is bright and the piece displays beautifully. The overall condition is very good, but it does have a number of very tight lines off the rim . . . only one being longer than 1/2 inch. There also is a flake on the very edge of the lid, but all things considered the condition is considered to be good overall. The bold decoration on the white Bristol Slip Band is stunning! The piece is 5" in diameter and 5-3/4" high to the top of the finial on the domed lid.